All sorts of images come to mind when one hears ‘Spring Break!’. Recalling my youth or remembering my daughters time away, so many years ago, it usually comes with a word of caution or fears of some sort of excess. Happily, we’ve had the good fortune to welcome the Bearcats of Willamette University for the past several years. 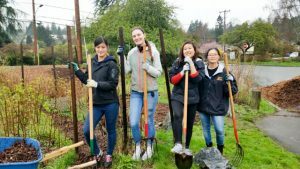 Meadowbrook’s Community Garden and Orchard gets a good day of service from a group of students eager and willing to make the site a great North Seattle resource. 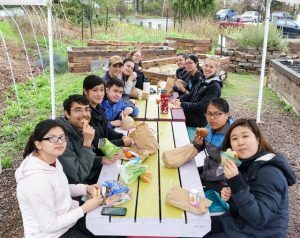 This year the group not only spread out mulch but the students spread themselves out to include service in the community garden. Besides spreading mulch in the Orchard for weed fighting, they also put down a bunch along the garden trails in the garden. This saves the backs of many a MCGO volunteer who not only serve weekly but also experience a different sort of Monday ‘blues’ with a myriad of aches and pains. Thank a Bearcat next time you see one. Lastly, getting a planting in with all the Spring rain and strong backs was also experienced. 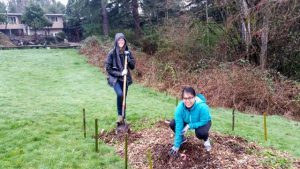 For the past three years mulching in the new West Orchard has happened with the intention of realizing good southern exposure and increased awareness around a variety of plantings. 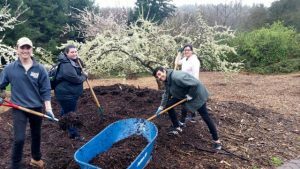 The students of Willamette U. helped plant honeyberries. A blueberry-like plant that, once established, is very hardy and productive. see a variety of both perrennial and annual sunflowers that are planted. Kids love them, birds love them. Excited for the sunny days and the annual return of the generous Bearcat. Working together, volunteers in East Orchard put their backs into it.